In linga PurANa, there is a story of Dadhichi (Brahmin) v/s Kshupa (kshatriya) as who is superior. Later Dadhichi did penance to Lord shiva and in turn was blessed to be protected by him and so was undefeated by Kshoopa (kshupa). So Kshupa took refuge in Vishnu and did penance. Vishnu replied that I do not punish Brahmins specially then they are devotees of Rudra, but still Vishnu said he will tryo. The end result was that Vishnu and all devata-s would not defeat Dadhichi. Later when Dadhichi almost won and there was dialogue, he even argued with Lord Vishnu. Here Dharma wins. You should not pray to God and expect to win over dharma. Vishnu who has himself took oath to protect dharma cannot let adharma win. So it was obvious that Vishnu was defeated. But victory gave pride, which is ego and so the behaviour of Dadhichi. This concludes that when we are in victorious mood, we would not even hesitate to defame and deny God. Later, there is a story in which BANAsura's daughter had abducted Krishna's son in order to marry him. BANAsura was protected by Lord Shiva. Krishna,when came to know the fact of his son being kidnapped, came with an army to fight with BANAsura. He found it difficult to fight Shiva, but Krishna was undefeated. Shiva had to plead Krishna to stop fighting and asked BANAsura to stop fighting. Here too, dharma wins. Even Lord Shiva could not win against Krishna who was on side of dharma. Technically there is no need, but Lord himself shows us the way. For us, Lord takes incarnation to teach us dharma and maryAdA. He does not need to practice any maryAdA i.e. he is not bound by it, as he is God. But here when I read this story, my heart vibrated with devotion. such a high standard was kept by Lord that he offered one of his eyes to Shiva (deity of worship). I may have worshipped Lord Shiva, but bhakti was taught by Lord Vishnu. For teaching Bhakti, he even became a devotee for us. So there is a deep reverence for Vishnu along with reverence for Shiva. When we read Shiva destroying Tripura, our devotion deepens. He gets a name TripurAri. So when we read Shiva Sahasra Nama, and come across name tripurAri, we at once remember the story and are filled with devotion for Lord Shiva. But if we think - Shiva could not do it alone, it was Vishnu who sat on top of arrow and Brahma and other Gods helped him. In this case, will I be able to increase devotion? The purpose of story is defeated. isn't it? Stories produce bhAva, which is important for spiritual progress. We would rad Krishna bleeds. Technically that is not possible. but still Krishna bleeds. So Draupadi, tore end peice of her saree and tied it to her Brother Krishna. Now Krishna is under her debt. When there is vastraharaNa of Draupadi, she calls Krishna for help. Note that she did not remembered him first. She turned to Krishna as last resort after no one present would help her. Krishna obliged. and what did he do? he saved her dignity. How much did he gave in return of a piece of cloth? we all know. Sri Ramakrishna says, if we take one step towards God, God takes 9 steps towards us. Krishna did what only god could do and the amount and the timing when he returned the dept and at the same time fulfilling his duty as Brother. Now we understand that Lord knew the future and so he bleeded for safety of Draupadi. Lord bleeds for us not because he is not Supreme. He would eat mud and the nharress his mother. But when she opens Krishna's mouth, she sees whole universe. So can we conclude that to to KalyANa of devotees, Lord also eats dust? We enjoy this mischief too. But if we think that it was bhagava who always eat first and then the food became prasad and was distributed to poor kids, else it may be taken away as tax, our perception changes. Prank does not remain prank. It is not to say that we should not enjoy his prank. If Krishna says sanyAsa from Upamanyu and chants Shiva's name, he is guiding us. Obviously he will not chant his own name. so he will chants Shiva's name. In turn he gave us Shiva Sahasranama. When Krishna stole cloths of gopi's bathing, we find him as - bad boy . But the reason. Women are not allowed to bath fully naked in public pond. So this was needed. Also the anger or any emotions actually binds us towards God. We get angry to whom we love. In turn what they got - bhAva Samadhi. See the extend Krishna goes for good of his devotees !!! Only Krishan can do it. When Brahma ji praises lord Shiva or Vishnu, it is for our own benefit. From praise, we get bhAva for that particular deity. So Brahma does not even mind his own status as supreme but shows us the way to worship NArAyaNa. When Both Brahma and Vishnu could not find end or beginning of Shiva Linga in form of light, Vishnu accepted Shiva's supremacy and Brahma didn't. In turn Vishnu was blessed while Brahma and Ketki and Cow were cursed. Truth wins. It fetches rewards. To make us understand all three played their roles. So what we thought as contradictory has common moral, and some values. In this sense, I ask, is there any need to reject any of these stories? Do TAmasic purANa-s give more and more ignorance or do they remove ignorance? Is it a not good thing to remove ignorance? Infact it is first thing to be removed. Avidya is a AvaraNa, it has to be removed to gain Jnana. Bhagavad PurANa says, there is no difference between Shiva, Vishnu and Brahma. But in that purANa. Shiva is not praised a supreme. So it is praised in another purANa. I see nothing wrong in it. What we and how we think is more important. Intention behind action is more important than action itself. Krishna is great e.g. of this fact. So, how should we interpret stories? positively or negatively. What is more important to to critical analysis or think in a way that it generates bhAva. Emotions are like seeds. Which one of them do we have to be watered and nurtured? positive or negative? Similarly if we take symbolism it helps us. It will help us too. If we think kauravas and purANas are inside our mind, it is not wrong. Abhinava Gupta ji wrote this in his Gita BhAshya. Tarka Sastra (science of dialectics, logic and reasoning) proposes “nahi ninda nyay” to support one’s theory. Glorify your view, but that doesn’t mean that the other view is flawed. With this nyaya, almost all contradictions can be neutralized. What is Advaita Vedanta? Can it be applied in today’s Practical Life? Voice of (Paramacharya) Sri Sri Chandrashekharendra saraswati, 68th shankaracharya of Kanchi Kamakoti Peetham. 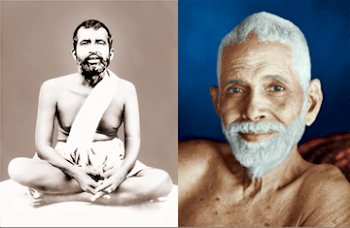 Paramacharya is considered as an authority in almost all spiritual matters.